On 29th July 2016 Universal Music release a six-disc box set of what is considered by many to be Simple Minds’ finest album, NEW GOLD DREAM (81-82-83-84). It will be the first time the entire back catalogue of this era has been collected together. 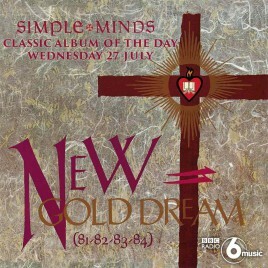 Originally released in September 1982, NEW GOLD DREAM (81-82-83-84) was Simple Minds’ fifth studio album and their crossover – the one that took them from revered cult status to a chart band with pop singles, launching their career worldwide. Featuring the no.13 and no.16 singles ‘Promised You A Miracle’ and ‘Glittering Prize’, it turned the band into a major force in pop music, reaching no.3 in the UK Albums Chart and spending a full year there. NEW GOLD DREAM opened doors and forcibly broke down barriers for Simple Minds. Until then, the band – formed in Glasgow in 1977 – had enjoyed considerable success and hard earned critical acclaim. A solid work ethic had produced four impressive albums in a frenetic three-year period. But despite the success of Life In A Day, Real To Real Cacophony in 1979 plus Empires And Dance in 1980 for Arista – followed by Sons And Fascination/Sister Feelings Call in 1981 for Virgin – the best was yet to come. In October, 1981, the band made their first visit to Australia, on the Sons And Fascination tour. The trip had a huge influence on the songs written for NEW GOLD DREAM. Recorded over a five month period at Rockfield Studio, The Townhouse and The Manor – with pre-production taking place at The Old Mill, a pig farm in Fife – in January ’82 the band actually laid down musical sketches for what would evolve into ‘King Is White And In The Crowd’, ‘Hunter And The Hunted’ and ‘Promised You A Miracle’ during a short tour rehearsal. The latter song would prove pivotal in terms of the direction they took next. The band unveiled ‘Promised You A Miracle’ during a Kid Jensen session on Radio 1 (included in this box set and available for the first time). Confidence in the song was such they were encouraged to record it as a single. The band hastily booked The Townhouse studio in London and Pete Walsh was recruited as producer on the recommendation of guitarist Charlie Burchill, who’d been impressed by his work on the remix of previous single, ‘Sweat In Bullet’. Released in April 1982, ‘Promised You A Miracle’ garnered heavy daytime radio play, a first for the band. In the preceding months, frontman Jim Kerr had taken encouragement when contemporaries such as U2, Echo And The Bunnymen, The Associates, The Teardrop Explodes and ABC had breached the UK singles chart. When it entered the Top 30, the band flew to London to pre-record a performance of the single for transmission on Top Of The Pops on BBC1 (included on the DVD component of this release – the first time it’s been commercially available). Their debut appearance boosted the single which climbed to No. 13 in the charts. The elation of their first hit single was short lived as the band buckled down to the real task in hand – the meticulous pre-production for NEW GOLD DREAM.